The line “big things come in small packages” has been used often to describe small form-factor chassis, so we’ll spare you this time. What we have today is Phanteks’ Enthoo EVOLV, a micro-ATX enclosure that’s big on features, but small on space. While our testing wasn’t without issues, it looks to be a diamond in the rough – as long as you’re willing to do a little polishing. When it comes to chassis, I’m all about making my systems as small as possible without skimping of functionality or performance. Thankfully most of the major manufacturers are jumping all over this way of thinking and are releasing some of the most flexible, feature rich enclosures that we’ve ever seen. 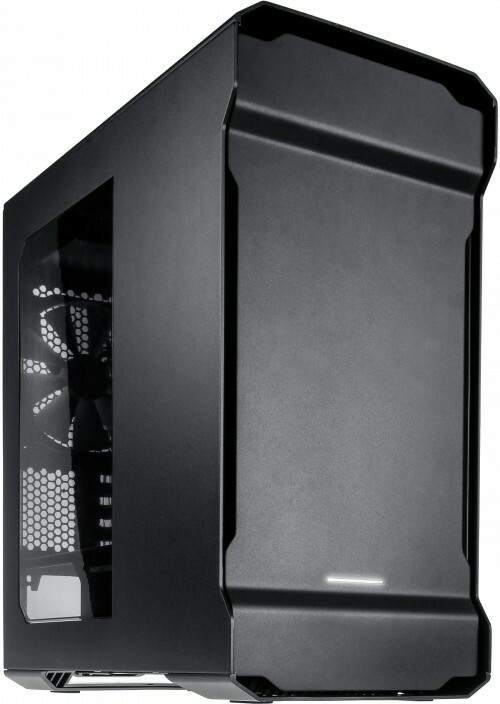 A new entry in the small form factor (SFF) arena is Phanteks, a company that up until now has built a reputation on its full tower Enthoo-series. When we received an email asking to take a look at a brand new SFF Enthoo model, we jumped at the chance. Finally, we have everything that the Enthoo series offers, but crammed into a micro-ATX (mATX) footprint. Without any further delay we present to you the Enthoo EVOLV. The EVOLV can be ordered in either satin black, glacier white, or anthracite gray. No matter the colour, though, it features aluminum panels all around. On the inside is a steel frame that supports micro-ATX and mini-ITX motherboards, CPU coolers up to 192mm tall, GPUs up to 318mm long, as well as radiators in multiple locations ranging from 120mm up to 240mm long. Overall the exterior design of the EVOLV is a little on the aggressive side due to the sharp lines and overhanging edges that jut out from the top and side panels. Other than a small translucent cut out on the lower third of the front panel that glows white when the system is on, there’s not much else to see. The front panel simply pulls off as does the large filter behind it to reveal a 200mm intake fan that can be swapped for a radiator measuring up to 240mm long. On the right side is a long window that stretches from top to bottom, but hides the area where the drive cage is usually found. Even with the reduced amount of visibility into the interior, the window still nicely shows off the components. Around back we start with one of the most peculiar design choices that we’ve ever seen, the rear facing optical drive. Further down is the motherboard I/O opening on the left and a 140mm exhaust fan on the right. Below those are four expansion slots, a small vented opening, and the power supply opening at the very bottom. The right side panel holds the power and reset buttons at the top and the microphone, headphone and USB3.0 ports about half way down. Up top there’s not much to see other than some vents that run down the side edges of the panel. This panel, like the front, pops off with a slight tug to reveal room to mount an additional 240mm radiator. The EVOLV sits on two wrap under-style case feet. There’s rubber pads on each corner to protect the supporting surface and absorb vibration, and the manual shows a removable dust filter for the power supply intake area, however it was missing from our review sample. Removing the side panels is done with a tug along the front edge, swinging them open, and then lifting up. From the left we see that the interior is broken up into two sections with the top set to handle the bulk of the components. The forward area is hidden by the drive mounting bracket that comes with rubber dampeners preinstalled and allows for various storage configurations. A power supply can be installed towards the rear in the lower section, while the front mounted two-bay drive cage is also hidden. On the backside of the motherboard tray we see the wiring and ports for the side I/O, two preinstalled Velcro cable ties, the six-channel, SATA-powered fan controller, a metal 2.5″ drive tray that can be placed in one of two positions, and grommet-lined cable management holes. At the bottom is the removable, two-bay drive cage, and the power supply area complete with rubber risers. Here’s a close up of the fan controller, which looks like a seven-channel unit, but it’s really only six channels with the 7th connection used to control the fan speed via a PWM-capable header on the motherboard. Included with the Enthoo EVOLV is a plastic flip-top container with separate compartments for all of the various screws. There’s also a bag with a few plastic zip ties, a couple of reusable Velcro ties, and 3 different coloured replacement LED lights. Finally there’s the optical drive bracket, a pump bracket for those who want to use a custom water loop, and of course, the user manual that’s very well written with loads of detail. Months ago we had received one of Phanteks’ full tower chassis, but it was a total write off due to some rough shipping, and a replacement unit couldn’t be arranged. Now that we have a pristine Phanteks’ product in house, we’re pumped to install our test system and see how it performs. Installing our test system in the Enthoo EVOLV was really easy. Once the side bracket was removed to open up the main interior section, all of our components fit in cleanly with no clearance or alignment problems. For being a mATX chassis, it really feels cavernous and should be able to handle almost any components that users can throw into it. When it comes to installing hard drives, the sky is the limit with the EVOLV. The bottom drive cage can handle two 3.5″ or 2.5″ drives, while a single 2.5″ drive can be placed in the metal tray that attaches behind the motherboard. The final option allows users to mount a single 3.5″ drive or two 2.5″ drives on the backside of the bracket that covers the front of the main section. This bracket can also serve as the mounting area for a water cooling reservoir or for the included pump bracket. We also tested out the installation method for the rear facing optical drive and found no issues. Once the cover plate is removed and the bracket is secured, the drive simply slides in and is held in place with the included screws. Keep in mind that using an optical drive will limit the size of the radiator that can be installed at the top of the chassis. With our test system installed, here is more or less what users can expect to see. This ended up being one of the cleanest looking builds that we’ve done to date. Total build time was about 25 minutes, which also puts it among some of the fastest, and this speaks volumes for the fit and finish of the chassis. Even though we didn’t snap a shot of the right side, there’s tons of room to stash cables, and the cover that hides the tangled mess in front of the power supply keeps the build looking super clean. All of our testing is performed in a near steady 20°C ambient environment with readings taken before and after with a standard room thermometer. AIDA64 Extreme Engineer is used for monitoring and recording all system temperatures throughout the testing process. Windows is allowed to sit idle for 10 minutes after startup to ensure all services are loaded before recording the idle CPU and GPU temperatures. CPU load temperatures are generated by performing a 20 minute run of OCCT LINPACK using 90% of the available memory, while GPU load temperatures are generated by OCCT’s built in test, also for 20 minutes. Stock CPU settings were obtained by setting the AI Tweaker option with the BIOS to Auto and the maximum stable overclock frequency of 4.0GHz was obtained after extensive testing to ensure stability. The final clocks for the GPU are 760MHz on the core and 1000MHz QDR (4000MHz relative) for the memory with the voltage increased to 1.087V using MSI’s Afterburner overclocking utility. As with the CPU overclock, testing was done prior to ensure full stability. Since shifting my focus to smaller chassis, the only other mATX enclosure that I’ve looked at so far using our current test system is the Corsair Air 240. Unfortunately when comparing thermal performance between the two, we were left disappointed. Temperatures with the EVOLV were well above what was expected with the CPU topping out at 67 degrees while overclocked under full load. This is slowly creeping up to the 72 degree Tcase Max as laid out in the processor specs, but it’s unlikely that most users will push their chip this hard on a regular basis. With that said, the EVOLV ran 6 degrees hotter than the competition, which could make all the difference. When it comes to the very finicky GPU, the stock cooling setup moves enough air to keep it from crashing, which we saw with the Corsair chassis, however it ran 2 degrees hotter than what we’re used to seeing in an enclosure with adequate air flow. This increase in temperature also meant that the GPU fan had to spin faster, which added a lot of extra noise to the system. Speaking of noise there was a very audible hum heard while running the fans at 100%, which is how we do all of our testing. To ensure this wasn’t simply a case of a loose fan transferring vibration to the frame, each fan was reseated, but the noise continued. Using the fan controller we were able to eliminate the hum by reducing the speed to about 70%, but in the end this solution will affecting cooling performance. All in all our time with the Phanteks Enthoo EVOLV was a positive experience with a number of bumps along the way. Thermal performance was less than stellar, and there seemed to be some additional noise from the fans when running them full tilt, but here’s how I see it. The EVOLV is an extremely solid, well-built chassis with oodles of room for expandability thanks to the multitude of options when it comes to mounting drives and coolers. In fact, I’d say that the EVOLV would be the perfect backbone for an entirely liquid cooled SFF system, and if I had the gear I’d probably work one up for myself, but unfortunately Santa didn’t quite come through this year. We were more than a little puzzled by some of the design choices with the rear facing optical drive bay being the biggest head scratcher. In fact, there’s something on every side except the front panel, so if the left side is put against a wall, the window is blocked, whereas the power, reset and ports would be blocked if the right side is put against a wall. Then there’s the optical drive, which would be blocked if the rear of the chassis is close to a wall. These design choices just doesn’t make sense to us since all features should be available at all times, regardless of where the chassis sits in the room. The fact that our review sample was missing the dust filter for the power supply also calls into question quality control. It could be that our sample was rushed from the factory in order to get it into our hands as soon as possible, but this would be a serious oversight for retail units, especially considering the price point of the EVOLV is a bit on the high side. As it stands now, the black version is retailing for about $129 to $145 USD depending on the colour, although we fail to see why there would be a price difference between the three. Even though what we saw wasn’t enough to award the Phanteks Enthoo EVOLV an Editor’s Choice Award, the fact that it has been prepped to handle some very aggressive cooling makes us think that this is the way to go. If you have the bank to fill it with this type of gear, if the design quirks aren’t an issue, and if the missing filter was simply a mistake, this might just be the chassis of your dreams. A cavernous interior despite the small footprint. A virtually useless rear mounted optical drive bay. A missing dust filter hints at possible QC problems.